It's been estimated that the group's latest venture will be responsible for 35 percent total revenue by the end of 2019. You know it as the quirky tour guide that never fails to deliver a great time in cities around the world -- kind of like that one overly-energetic friend in the group whose thirst for adventure is never quenched. But soon enough, Time Out will be known for more than its on-point reccos of dive bars and fine dining. The company is gearing up to open a series of markets in a bold move that will immensely restructure its revenue model. "Go big or go home," Time Out Group CEO Julio Bruno told Campaign US from the New York City headquarters high above Times Square -- far, far away from the kitchen table in London, England, where the magazine was birthed in 1968. Bruno (that one overly-energetic friend in the group whose thirst for adventure is never quenched) is doubling down on a gamble the company made in Lisbon, Portugal, back in May 2014. Editors saw the opportunity to turn an historic city market into the Time Out Market. It’s hailed as the world’s first food and cultural market experience rooted wholly in editorial curation. The best chefs, drinks and experiences are handpicked by the publication’s writing team which test, taste and review what the city has to offer. 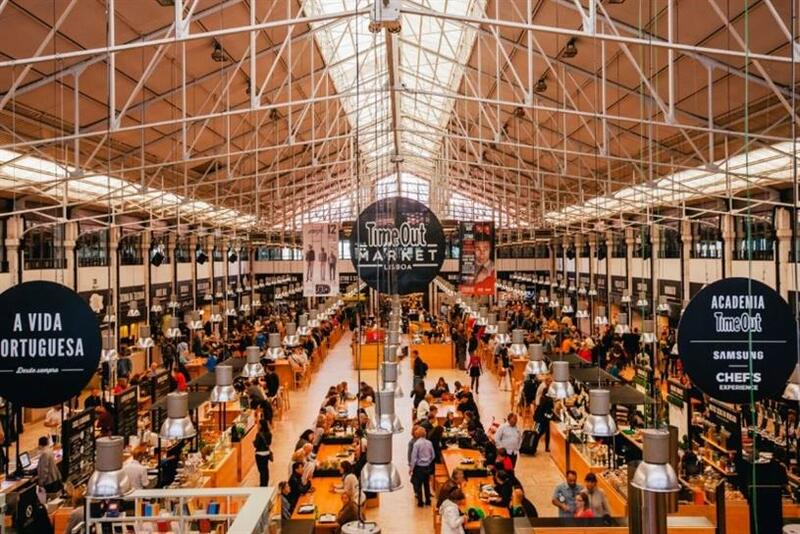 Time Out Market Lisbon has turned into a goliath success and is now Portugal’s most popular attraction. Almost four million visitors come to the market every year to explore grub from 32 restaurants and kiosks, enjoy drinks from eight bars and cafes, buy from five shops, attend cooking workshops in the Chef’s Academy and events in the 900-capacity Time Out Studio. When Bruno joined the company in 2015, he saw an immediate opportunity to capitalize on this. Now, hot on the heels of Lisbon’s market finally turning a profit, the team is wasting no time in launching venues around the world. By the end of this year, Time Out Market doors will be open in Miami, New York, Boston, Chicago and Montréal. London Waterloo and Prague are planned to house locations in 2021. All of this will span a total of almost 250,000 sq ft with more than 4,500 seats and 140 of the world’s top chefs. "We know from the success we have seen with Time Out Market Lisbon that this is a proven format already; Time Out Market Lisbon has achieved positive EBITDA within 18 months of opening," explained Bruno. "So we have taken a measured approach to risk – we have a highly successful working model in Lisbon, but we have also sought to de-risk the strategy by tweaking our markets model towards less capital intensive strategies like the management agreement models we have signed with landlords in Montreal and Prague." Some analysts expect that by the end of the year, around 35 percent of the group’s revenue will come from Time Out Market business. The strategy Bruno’s shooting for is that the markets will work hand-in-hand with the publication’s online and print presence to drive traffic and readership across the 315 cities it’s physically in. He continued: "Eventually, we see the benefits flowing in both directions as millions of visitors to Time Out Market results in growing interactions with the Time Out brand which in return drives eyeballs and awareness, increasing our relevance for advertisers." Bruno strongly believes these markets are the direct answer to the unfavorable landscape media companies are faced with today. "Our industry is constantly changing and is facing many challenges; just think of the likes of Facebook and Google whose share of global advertising spend has been constantly growing," he explained. "This has been very challenging for some media companies, in particular those who haven’t found ways to diversify their business; I believe that we have successfully navigated these changes with a strategy and business model allowing us to diversify, transform and grow Time Out." A continued focus to invest in quality of content is a priority. While many newsrooms within other publications continue to cut resources and (in some cases) entire departments, Time Out is still hiring writers to send out to review everything cities have to offer. The drive for powerful content aides Time Out’s mission to deliver multi-platform creative solutions for our clients spanning all channels, with a spotlight on the brand-safe environment it’s built. "I can’t think of many media companies that could create and deliver a format like Time Out Market globally," added Bruno. "We are synonymous with the best of the city and that is why Time Out Market is the perfect extension of our brand – we curate the best of the city, and now we bring the best of the city to our audience. This is something we can own, more than other media companies."